If you’re a car manufacturer and not looking at how you can add a crossover to your model line-up, you’re probably aiming your efforts in the wrong direction. The linear range of hatchback, saloon and estate has found SUVs thrust into the mix, with many embracing chunkier and more radical design. For some this was an opportunity to add an off-roader to the mix, but for many, it’s opened the door for crossovers. And it’s in this smaller segment that we’re seeing a lot of activity. The Kia Stonic (as in stone-ic, not gin and s-tonic) is based on the Kia Rio and is typical of such a crossover move. The company already has the Sorento and Sportage in the SUV-proper range, it has the Soul in the mix too, while the Stonic rolls into the smallest position with no aspirations to offer anything more adventurous than a higher ride height and those contemporary looks. This is the partner model of the Hyundai Kona – and we suspect that choosing between these models will come down to which exterior design you prefer and how you feel about the brands. But there is a lot of, pardon the pun, cross-over between these two models. There’s the price, too, with the Stonic starting at just over £16K and the Kona rolling out at £100 less – although Hyundai then go on to offer eight different trim levels, so yes, the Stonic potentially remains the simpler choice. Characteristic looks stylise the Stonic, giving it those Tonka truck-like chunky lines. There are big wheels sitting near the corners and roof rails, with nicely pronounced front arches that make this car look the business (whatever the business is). The strong lines of the front seem to drop away slightly towards the rear as the arches are swallowed into the rest of the body and look less pronounced. Those strong arches curve into a chunky bumper, which again gives the impression of strength. The Hyundai Kona cuts slightly slicker lines, leaving Kia to be a little more brash – and the sense we get is a sort of “active lifestyle” approach from Kia, while Hyundai looks like a “fashion first” angle for what is, essentially, the same car. 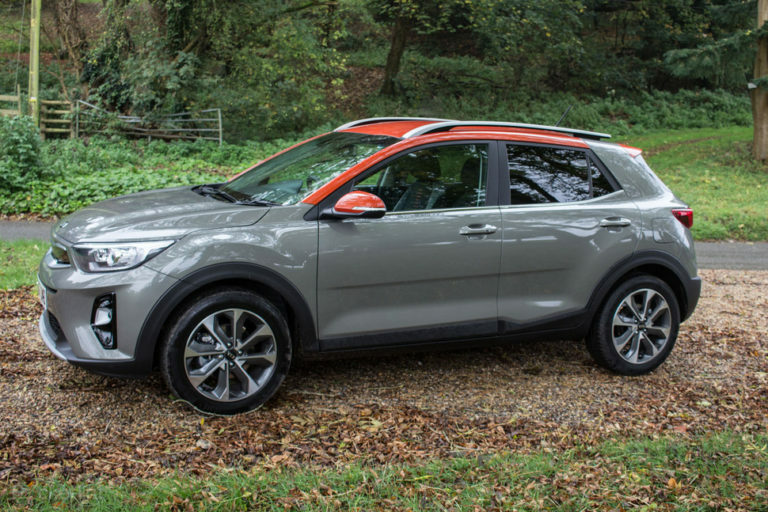 Aside from the normal range of colours, Kia is offering a range of two-tone paint options, which is very much the trend. It’s something we encountered on the new VW T-Roc, with customisation being very much in demand on these smaller cars. It adds individuality – something that Mini has really benefitted from for example – and there’s appeal for those who want their crossover to be a little more fun. But we find it harder to fall for the Stonic’s looks than some of its more pricy rivals. It isn’t quite as whacky as the Nissan Juke or the Toyota C-HR. We think that the T-Roc and Audi Q2 look a little better. Squint a little and it’s not so far removed from the Dacia Duster or Peugeot 2008SUV, the latter of which, incidentally, is about the same price. Slip inside and you’ll find the interior matches the £16K starting price of this car. Kia is keeping it really simple with the trim levels for the Stonic. There are two grades, the 2 and the First Edition. While the 2 gets the lower starting prices, it’s the First Edition that gets the quality lift, and quite a lift it is too, so we suspect that the pricier model will garner the most interest – certainly it would be our recommendation, even if it sees the price rise to £19,695. 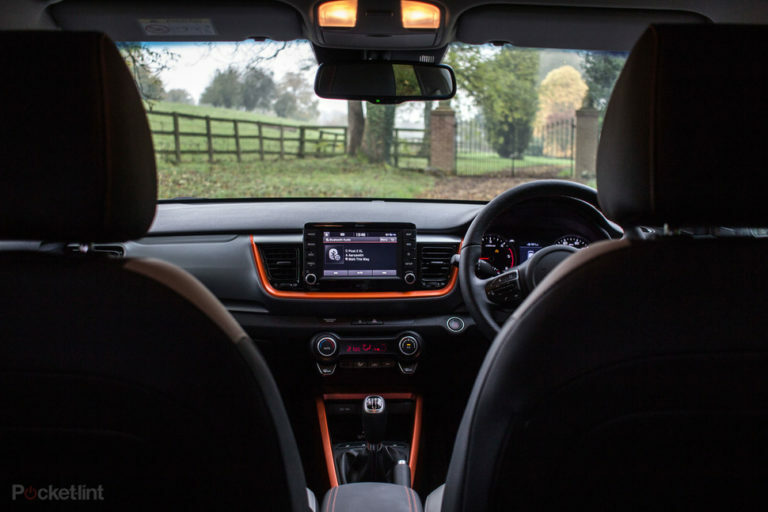 The interior of the Stonic is mostly hard plastics, there’s not much that gets a soft finish, except on those key touch points – the steering wheel, gearstick and the handbrake – which, to a certain extent, perfectly fits the price point. For those with children, that’s not so much a downside as it is a benefit – it’s easier to baby-wipe hard surfaces when they get filthy. 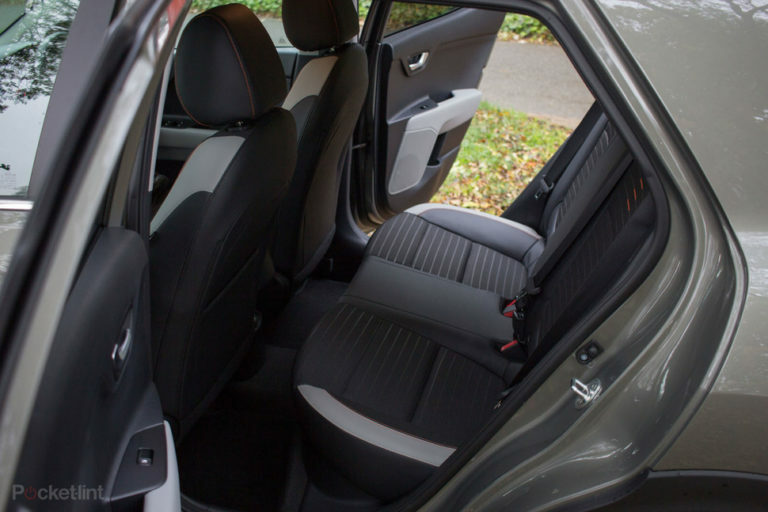 Cloth seats adorn the 2 spec and things sit towards the no frills end of the scale; move to the First Edition and while you’re not getting a complete leather seating option, there’s faux leather trim to the edges and a general uplift across the cabin. This includes a rather ambitious flat-bottomed steering wheel which might raise a smile. 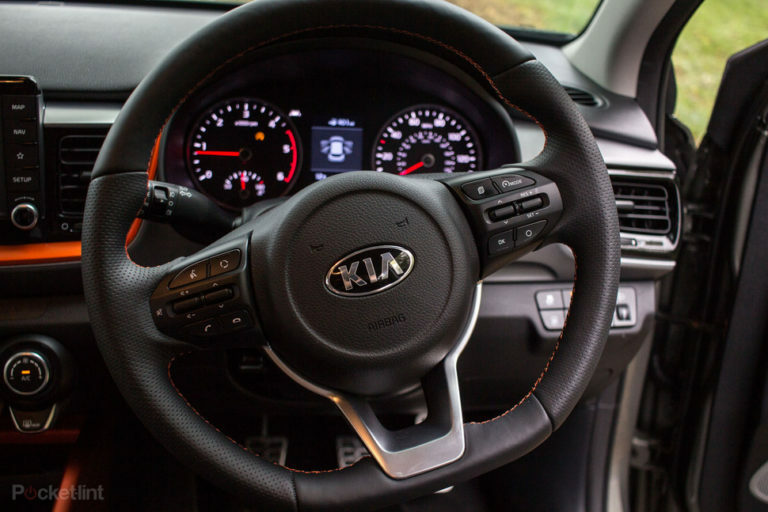 It’s the sort of thing you see adorning sports cars, but giving you that sporty feel in the driver’s seat seems to have been on Kia’s priority list. On the First Edition it’s wrapped in nice perforated leather with heating too, although the proliferation of controls it offers makes it a little busy. There are also colour highlights that come to the interior, matching some of the interior trim to the contrasting roof colour on our test car. This gives a flavour of personality to the interior, in the same way that Fiat does on the 500. Again, it’s about adding character, although within the test fleet we saw some models where their interior highlights were totally different to the rest of the car: moving from a lime green roof to lemon yellow interior is more than a little disorienting, so choose wisely. The First Edition is the more comfortable and higher quality interior, filling in a number of the switch blanks with actual functions. We daresay that if the Kia Stonic sells well, there might be more options in the future, but unless you’re really squeezed on budget, the 2 spec does look a little sparse by comparison. Some will immediately call out the interior as “cheap”, but that would really be a disservice. If you’re after a plush cabin, turn your eyes to the Audi Q2 or Q3, or the Mercedes GLA. There’s no shortage of options to spend more within other brands for a more luxe experience. For the driver and passenger there’s plenty of elbow room and headspace. For those in the back, it’s very much a hatchback experience, offering ample headspace, but legroom isn’t huge. You can fit a couple of adults in the back, but it’s a space that’s better suited to the kids. Like many of these types of cars, the boot space isn’t enormous either. Sure, it will get you home from the supermarket or away on holiday, but it’s not the most practical 352 litres of space. 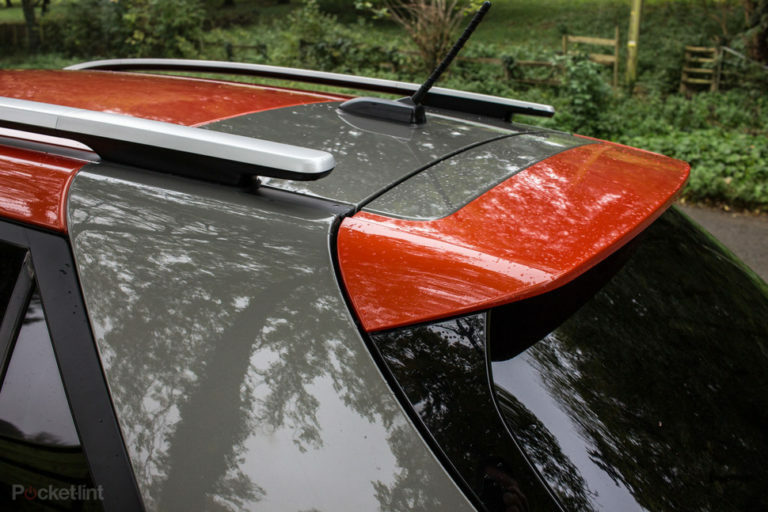 You might have to deploy those roof bars if you’re planning on taking the family camping for the week. With trim choices kept to a minimum, Kia has applied the same logic to engine choices. If you’re buying the First Edition there’s a petrol (1-litre turbo-charged) or a diesel (1.6-litre), both of which are mated to a 6-speed manual gearbox driving the front wheels (there’s no ambition to be an off-roader, so the lack of an all-wheel drive option doesn’t surprise or worry us). This isn’t a common move when buying a car – where the number of engine choices presented to buyers can be a bit baffling – it’s common for Kia. While that means there’s less choice to really buy the car that fits your demands perfectly, we suspect that many will welcome this simplistic approach, as it’s a lot less confusing. The 2 trim model adds an additional engine, a 1.4-litre petrol – the cheapest and lowest power of the lot – but we haven’t driven that, so we’ll talk about the other two. The 1.0-litre turbo-charged petrol might sound a little under-powered when you read it out load, but these small 3-cylinder engines have been doing great things in recent years. It’s a peppy little thing that will whisk you to 62mph in about 10 seconds. While it might not see you dominating the fast lane on motorways, it’s the sort of little engine that’s great for city driving, where its ability to get up and go will see you jumping off the line and darting through traffic. The second choice is the 1.6-litre diesel. This is a little more torquey than the petrol and a touch noisier in normal driving, but while you’ll get better fuel economy from it, the drive is very much the same. It’s a touch slower getting to 62mph, but we suspect the real decision here will be about your perception of diesel, rather than the £800 price difference. 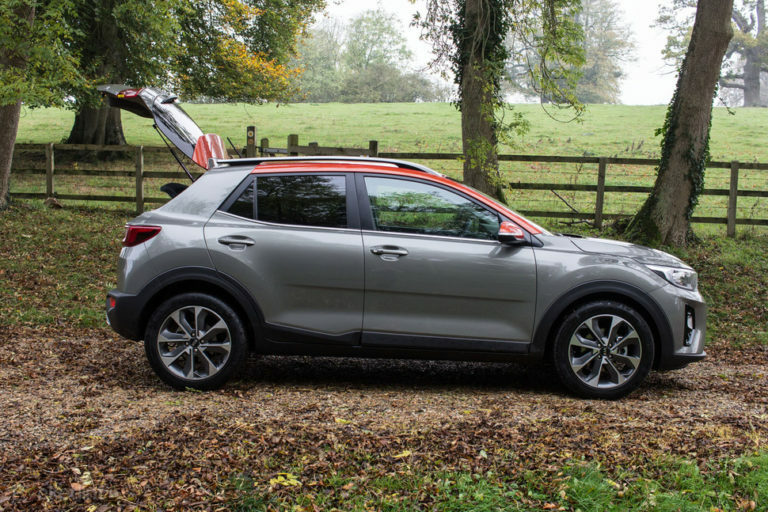 Where you might find the Kia Stonic struggles a little is when it’s fully loaded with family and luggage, trying to tackle steeper hills as you head off on holidays. It’s here that the restrained engine power might be felt, but in your normal driving it feels like a good balance. And let’s face it: most of the time the heaviest load you’ll be hauling is the weekly shop home from Tesco. There’s also little to really complain about when it comes to the ride or handling. The suspension is perhaps a little firmer than you might expect. That fits the sportier styling of that steering wheel and is designed to avoid the wallow that once plagued this sort of higher-riding car. Otherwise the steering is light enough to be comfortable, making this an easy car to drive and an easy car to live with. For many, the appeal will be in that higher ride height and the visibility it affords on the road. Some cars’ over-styling can make them feel a little more enclosed than needs be, but the overwhelming sensation from the Stonic is that you can see all around you at a glance, and that’s likely to be popular with those on the school run, nipping to the supermarket, or dashing through suburban streets. Sitting central in the Stonic’s dash is the 7-inch display. On the 2 trim model you’ll have to operate this via the buttons that flank the display, while the First Edition sees this boosted to a touchscreen for increased interactivity. It’s a fairly easy system to use, and we’re still fans of those buttons clearly marked with names like “nav” or “radio”, as it takes you where you want to go without messing around. DAB radio is also standard. 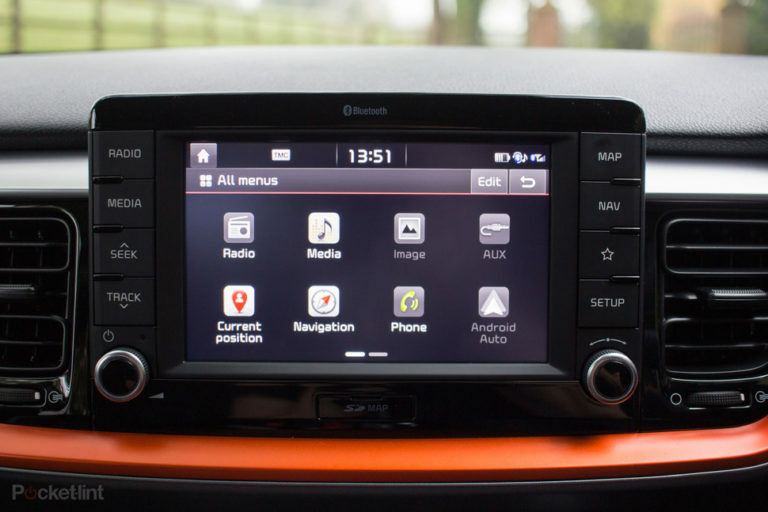 The system is a little busy in terms of visual design – but some may rarely see this, as all Stonic models offer Bluetooth connectivity for your phone, as well as Android Auto and Apple CarPlay as standard. This gives the Stonic appeal over the larger but default choice from Nissan, the Qashqai, which offers neither of these convenient systems. If you’re an owner of an iPhone or Android device (which you almost certainly are) then you’ll be able to tap into those systems on the Stonic for a more seamless smartphone experience. You might even prefer the Google Maps navigation experience to that offered by the car, which costs you nothing extra. Aside from entertainment and smartphone connectivity you also get other essentials like rear parking sensors, with safety technology swinging into place for the First Edition as standard. This includes blind-spot detection and rear cross-traffic warning, to make sure you don’t reverse out into someone driving past you. Lane departure and emergency braking also come as standard to the First Edition (or as options for the 2) both designed to keep you safe on the roads. The additions that you get piled into the First Edition make it look like a good deal, putting you on the road with plenty of extras that you might pay a lot of money for were you to opt for some rival brands. This is characteristic of Kia and it’s one of the reasons that its cars are good value for money. In the crossover market – or B segment SUV, if you pefer – where there’s a furious amount of competition right now. What started with a few curiosities like the Nissan Juke has exploded into a range of cars you might choose over the traditional hatchback – avoiding the affront that is the expanded or “plus” versions of those models. You get more space in the interior on these models, making for a comfortable drive and ride with increased visibility on the road. 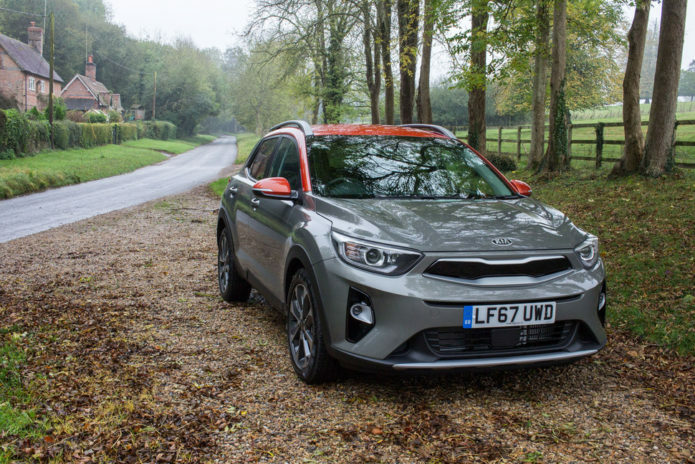 The Kia Stonic is isn’t pushing the marque of a premium brand, but you’ll likely be surprised by how much you get for the asking price. We’d seriously consider the First Edition for the extras you get over the 2 edition, with the interior changes bringing a premium lift to make the Stonic a little more exciting. To Kia’s credit: there are a lot of tech bundled in that would cost you a lot in options elsewhere. 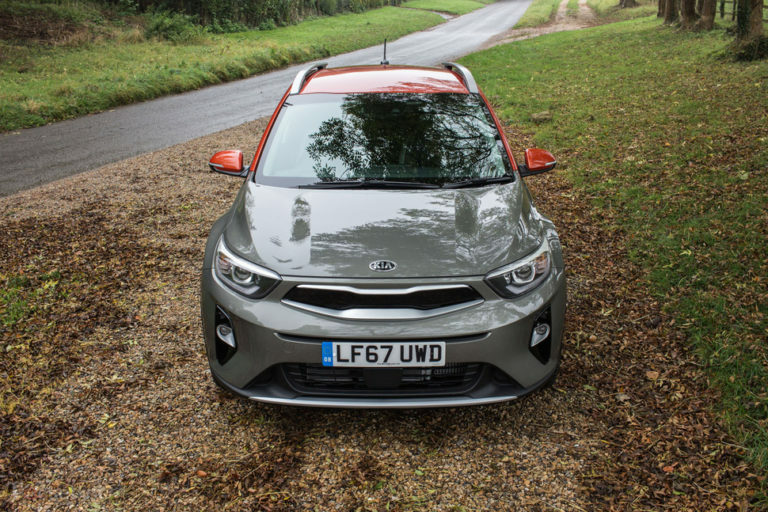 Kia’s growth in the UK over the past few years can’t be ignored. A real shift in design, a 7-year warranty as standard, and a simple approach to equipping the cars with plenty of tech make for an appealing platter. The Stonic might not be the best-looking car on the road in this segment, but it’s a fun little thing and seriously worth a test drive if you’re looking at replacing your tired old hatchback. 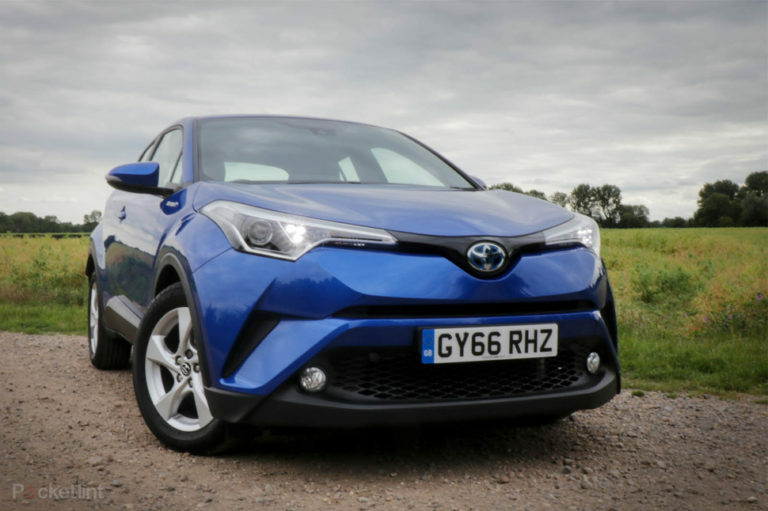 Kia would argue that the C-HR is a level above the Stonic – the Toyota is longer (4.3m long) and generally more expensive – but it’s one of our favourite small crossovers because it looks so distinctive, is spacious inside, and it’s shot through with a level of character that you might not expect from a Japanese brand. The interior, in particular, is an enjoyable place to be and if you’re wanting a slightly more practical than hatchback car, the C-HR throws in a big boot, to er, boot. There are a couple of additional engine choices beyond what Kia offers, including a super-economical hybrid setup borrowed from the Prius. Only an old fashioned infotainment system and some slightly eye-raising prices as you spec it up might put you off. Okay, we’ll admit, if you’re going for something that’s stylish and fashion-orientated like the Stonic, a Duster might not be on your radar. But bear with us… Renault’s budget brand offers a vehicle that’s highly likeable and comes up trumps thanks to its rejection of fashion, no-nonsense approach. There’s a utilitarian chic about the Duster (buy one in white for full impact) and while we’ll admit that it’s not the best drive, or indeed doesn’t offer any of the safety or tech kit of the Kia, you will be laughing all the way to the bank. Because the Dacia is a bargain. And if you’re country bound, live down a bumpy track or regularly encounter mud, snow or ice, then a 4-wheel drive version on skinny tyres will take you to places you’d otherwise need a Land Rover to reach. It eschews the crossover fad, for an old-school 4×4 feel.